Anyone can build a blog. It’s easy. Heck, I’ve got two blogs–both about completely different things. The struggle I face is not so much running the blog, or creating content for the blog, but rather getting high-value traffic to it. Can you relate? I thought so. Well, what if I told you that in less than a month, I grew my personal blog traffic by 600%? But wait! On top of that, in less than a year with the help of the Venngage team, we grew our entire site traffic by 400%. Oh yeah. This stuff is repeatable. After reading this guide, you will have access to not only my personal super awesome tips for starting a blog, tactics for growth and for boosting blog traffic, but you will also have access to the super awesome tricks used by Venngage. So if you don’t have time to read this now, bookmark it for later, or download it as a PDF to read when you’re commuting to work, sitting on the toilet or on a boring Tinder date. But read it. Let’s get straight to business, shall we? Just like losing that last five pounds, or breaking up with your partner of 10 years, it’s not easy to boost your traffic by 400 to 600%. But if you want to get the job done right, you should probably set aside the next five to 125 minutes to get through this guide. You can thank me later. Shall we move on to the first step? If you don’t know who is reading your blog or using your product, then how can you expect to get more of that kind of person to come back? Understanding your audience or user personas is integral to acquiring high-quality traffic to your site. By conducting research, you can become more aware of exactly what kind of people are interested in what you have to say. So what is the process for understanding exactly who is engaging with your content? This section will cover five very important points that will help you gain a better sense of who your audience is, and how to create compelling content for them. You likely have a general idea of the type of people reading your content. Are they marketers? Educators? Are they predominantly men or women? Old people or young people? Trump supporters? Not Trump supporters? How can you better understand the demographics of your user base? 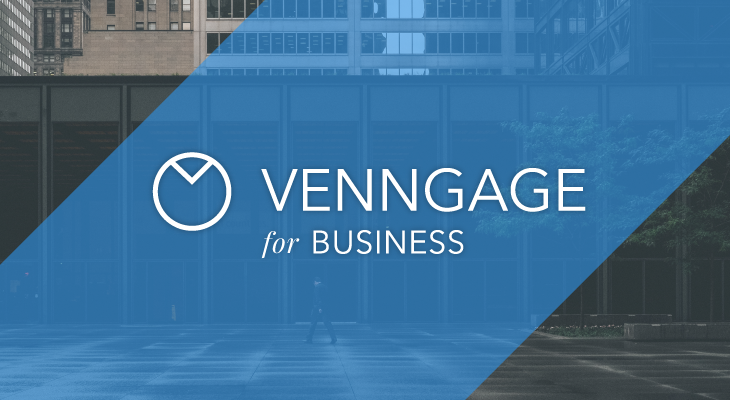 Along with the rest of the marketing team at Venngage, we developed a process for answering all of these questions…and more! 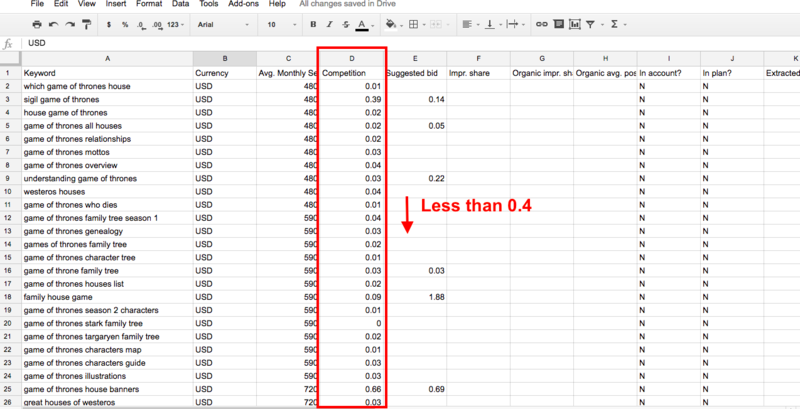 Create a spreadsheet where you can track the top readers of your blog. These are the individuals that are consistently clicking the content you send out. Give yourself a pat on the back. You’re one step closer to identifying the demographics that are actually looking at your content! Now that you have your list of top readers, it’s time to identify exactly who they are. Well, my dear, this is the part where you harness your deep-rooted P.I. skills and go Jessica Jones on these readers. I use LinkedIn to track down who my readers are because it provides me with all of the information I need. Just install the Chrome extension Rapportive and begin typing their email addresses into Gmail. And just like magic, you will have access to everything you need to know about your reader. Isn’t that both awesome and terrifying? Use Rapportive to stalk track down as many of your readers as possible. There’s no need to go overboard, but you should aim to fill out this information for at least 100 different people. This will give you a decent sample size so that you can get a general idea of exactly who is clicking on your emails. Here is a ready to use spreadsheet you can download in case you are too lazy to make your own, like me. Except I did make this one, so I am not lazy. Once you’ve identified a significant sample of your top readers, you can document this information as a chart or an infographic. Use a filter in your spreadsheet to quantify the variation in gender, job title, age and industry. You can upload this information directly into one of the charts on Venngage, or use Beam if you’re looking for something a bit more simple. Create a different chart for each category. 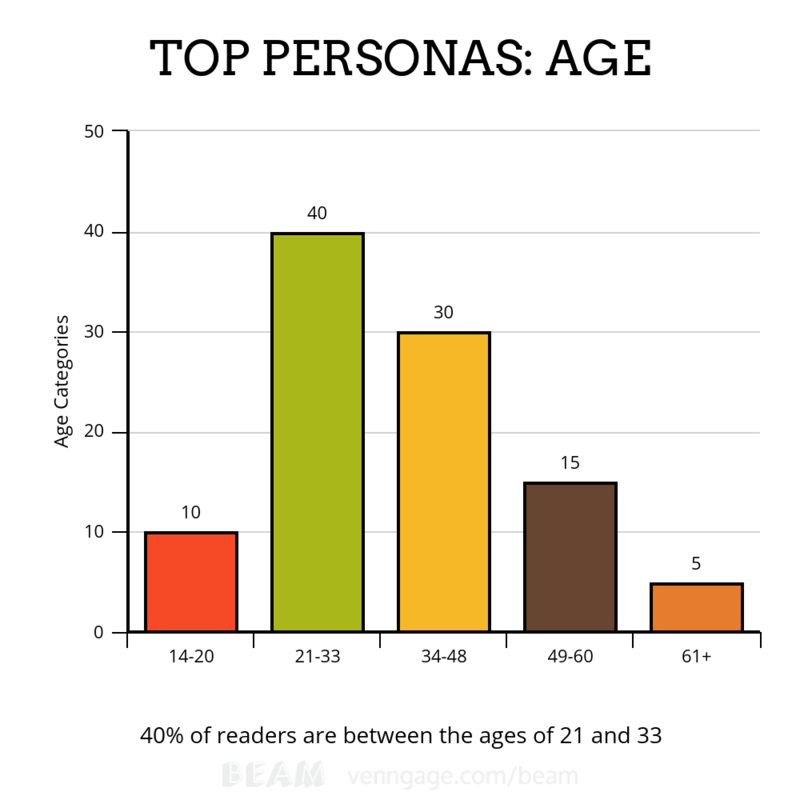 According to this chart, I can conclude that 40% of my blog’s readers are between the ages of 21 and 33. After creating a chart for each category, I might conclude that in addition to being between the ages of 21 and 33, the majority of my readers are women, who work in the Marketing and Advertising industry as Social Media Managers. Great! Now I know exactly who to target if I hope to increase my blog traffic and conversions. Well, my young grasshoppers, the reason is not only to make the data easier to reference in the future and share with your teammates, but it gives you some solid content so you can write a blog post about your experiences later. Duh! Although the method for identifying your top readers is an important one, you still need to be able to acquire more of them. Don’t worry! We’ll get to that right away. I now know that the hypothetical top persona for my blog is a woman between the ages of 21 and 33, who works as a Social Media Manager in the Marketing and Advertising industry. Lucky for me, this is a kind of person who is very vocal in the online space. After all, it is her job. But where do I specifically go to find her? And how do I build and foster a relationship with this individual? I’ma tell you right now. Sure, it may seem like lurking the forums is on par with taking a trip back to the 90s, but they are still very widely used to get advice on almost any topic. Think of the last time your iPod stopped working, or perhaps you wanted some more insight on a new restaurant that opened on your street. One of the first places you might look to is a forum online. They are an ideal place to understand what your top personas are in search for, and to share your expertise. Reddit is basically a massive online forum, so consider that a starting point if you are really lost. Quora is like if two forums were to get together and have a baby, and that baby ended up being the ultimate forum. This is a great community and there is always plenty of opportunity to provide value to potential users of your product, and readers of your blog. Another option for you is to create a Slack group and invite your existing top users to participate in conversations with each other and with you. Urge them to invite their colleagues and other individuals they think might be interested in the content you are creating. Chances are that if they are already invested in your content, they will not be opposed to advocating for you. Twitter chats, LinkedIn groups and Facebook groups are excellent ways to find your top readers. Almost everyone has a Twitter, Facebook or LinkedIn account, and in many cases, they have more than one. Social media provides plenty of methods to access smaller and more focused groups. Hootsuite has weekly Twitter chats and has mastered the process for setting one up. Brian Fanzo has even prepared a calendar of multiple Twitter chats taking place on a weekly basis. Thank you, Brian, for your wonderful contribution to the world of digital marketing. There even exist LinkedIn groups designated to specific interests, conferences and events. You can join the groups that are relevant to your community in order to better understand what struggles your potential community members are facing, and what type of content they are reading and sharing. Facebook groups are one of the most common means of building relationships within the community. Whether it’s a group sharing their favorite pictures of dogs around the city (yes this group exists), or a group of digital marketers helping to answer each other’s questions, there certainly exists a group for the niche you are hoping to get in touch with. Seriously, there is a group dedicated specifically to Irish bloggers. It can be overwhelming to keep track of all of the above sources. Even though your audience might be frequenting each one, try to focus on a single channel at a time. It will not only make your life easier, but will allow you to focus more on a smaller group of personas and establish a relationship with them. In the long run, quality is way more important than quantity. This method not only gave us direct insight into the problems our users were facing, but it also strengthened our initial persona research and validated that our little stalking experiment was actually useful. Naturally, some people did not quite understand the initial question, but for the most part we learned some interesting nuggets and got a lot of new ideas for content. Thank you, odd stranger, for sharing your struggles. Although not entirely helpful, we still gained a sense of what this person does for a living. Despite some of the responses we received after emailing our users, a large percentage of them were in fact useful. They provided us with a huge list of struggles that we would then be able to transform into new high value content. So really, we got them to do all the work for us! But how do you plan out content suggestions from about 5,000 responses and figure out what to blog about? Naturally, you’re going to want to make sure the content you are writing addresses more than just one person’s problems. Go back to that spreadsheet you created with your top users. Open up another sheet within your initial spreadsheet and label it “Content Tracking Sheet”. Just kidding, it’s not that exciting. Categorize your struggle column into five to 10 reoccurring issues your readers are having. This might relate to marketing questions, concerns about your product or tool, pricing and payment issues, or concerns with creating specific content. Try to be specific if you can. Seems relatively straightforward, right? Once you’ve seen some consistency in the struggles your users are facing, create a drop down menu of those 5 to 10 struggles and then continue adding name after name. What this does is ensure that you maintain the same wording throughout, instead of switching between various terms for referring to the same subject. I would recommend hiring a VA to do all the data entry for you, especially if you’re planning on documenting responses in the thousands. It’s a relatively menial task and quite frankly, your time can be put to better use. Am I right? I’m right. Once all your 100 to 5,000+ struggles are entered into your spreadsheet, you can easily filter your list to see which concerns are most prominent among your users. Again, don’t feel like it’s necessary to list every single person’s struggle into your list. You can add a sample portion of about 100 to 200 responses and that will still give you a general idea of the issues your users and readers are facing. After you’ve noticed some commonalities in the struggle column, you can start creating content. This is the part where your organization skills kick into gear. Decide how often you plan on releasing a new blog post. Once a week? Twice a week? Daily? I’d recommend starting out with once a week. This will keep your tips coming consistently, but you won’t burn through your list of topics too quickly. It will also give you more time to produce really good content. It’s not enough to just plot out all your deadlines on a calendar. As Nat Eliason stated in an article on the SumoMe blog, you’ve got to stick to it and lock it in. 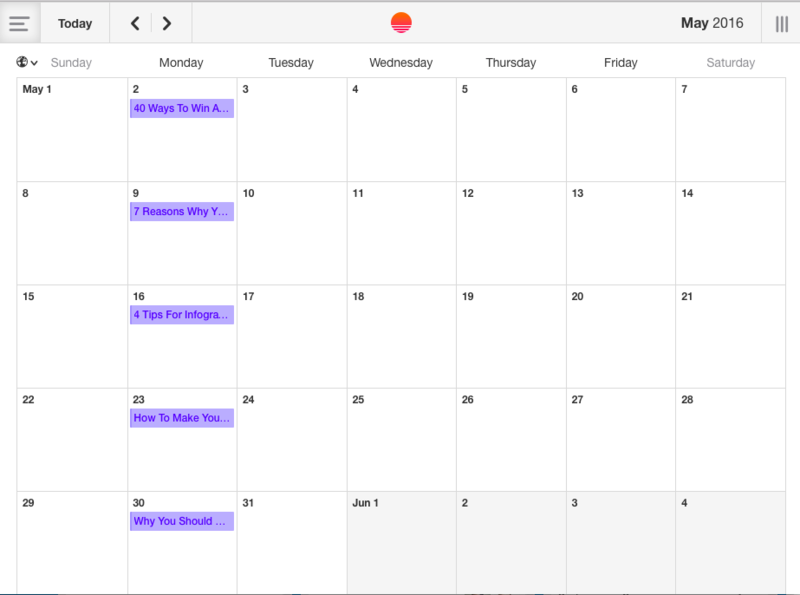 If a calendar isn’t your thing, try using Trello or Asana to schedule your posts. But make sure you do stick to that schedule. Make sure your blog post follows the rules of P.E.A.C. content. This stands for Practical, Educational, Awe-Inspiring and Credible. When you produce content that provides value for your audience, they will keep coming back for more. By making it entertaining and awe-inspiring, you keep them engaged and excited. And by linking to relevant sources throughout your article, you show that you’ve done your research, and that your content is credible and relevant. As you get more comfortable with producing the content in your calendar, and you get faster at it, you can start repurposing that information into different forms. Try creating a powerpoint template that you can upload to SlideShare, or use an infographic maker to create a data visualization. Try to expand the reach of your content by catering to the tastes of different people. 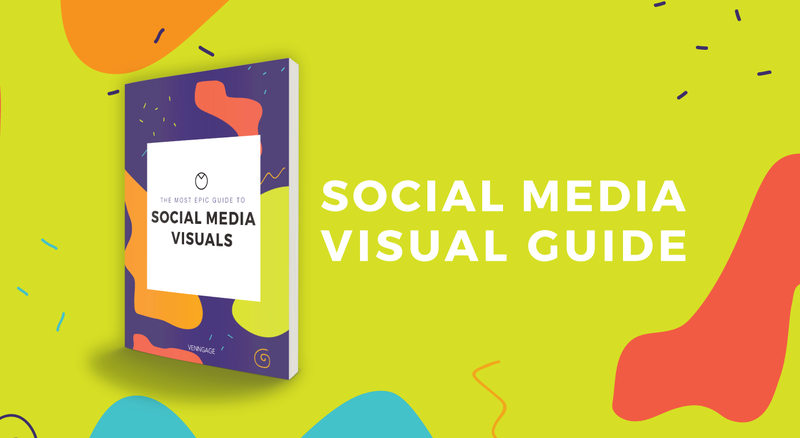 Besides, some individuals in your audience may prefer visuals over posts that are written. Getting to know your audience plays a huge part in finding blog traffic success. When you understand who you are writing for, it becomes much easier to produce relevant content. After all, you wouldn’t try to sell chicken to a vegan, right? So stop writing content that doesn’t appeal to your readers. This is only the first step of many, but a very important one. So I leave you with this information for now, young Padawan. For those of you who were born yesterday and do not know what SEO is–it stands for Search Engine Optimization. In a nutshell, this means using different methodologies to increase the amount of organic traffic to your site. In the past, many people used methods which would today be coined as Black Hat SEO techniques. No, this does not mean that you wear a black hat while working towards boosting your SEO. Rather, it means using risky methods that Google does not like, resulting in your site’s penalization. In fact, even today people still use these tactics and wonder why they are not moving up in PageRank. Before you leave, download this section on optimizing your content for SEO as a PDF. These are all actionable methods that myself and the team at Venngage have used, and I would hate for you to miss out on the opportunity to increase your blog traffic. Read it now or read it later–it doesn’t matter, but read it. Google literally runs the world. Think of Google as Sauron the all-seeing eye from the Lord of The Rings. If you think of Black Hat SEO techniques as the One Ring, then whenever you use them, Google will find you. Terrifying, right? So how do you avoid the wrath of Google? You need to use White Hat SEO techniques. Simply stated, White Hat SEO is the opposite of Black Hat SEO. It refers to using methods that boost your performance on a search engine results page (SERP) without going against the laws set forth by Sauron/Google. In other words, it means creating high-quality original content, that people want and need. Easy, right? Unfortunately, there are approximately 2 million blog posts written and published every single day. So ensuring that your content even manages to get seen is a struggle and a half! Ensuring your content is P.E.A.C. Once you master these strategies, getting your site to rank as #1 on Google will seem as easy as tying your shoelaces. 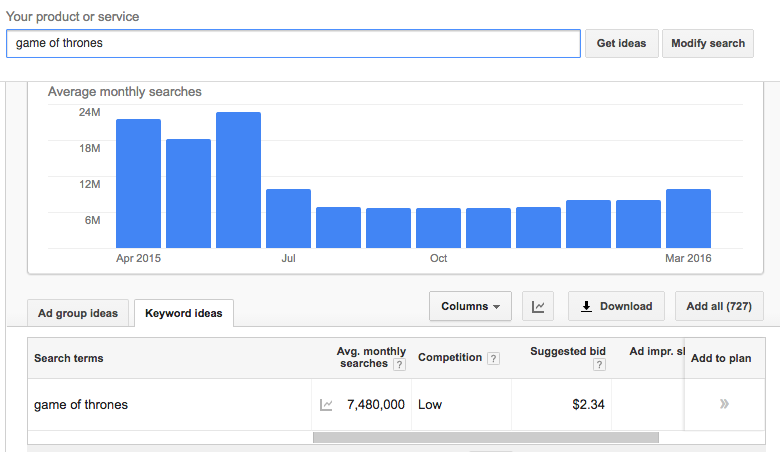 How often do you do keyword research before you dive into writing an article? If you selected rarely or never, don’t worry. You’re not alone. In fact, 74% of marketers don’t have a content distribution plan at all when it comes to increasing blog traffic. While it’s still possible to rank high on certain long-tail keywords, if no one is searching for those terms to begin with, what’s the point of even creating the content? You might get a few new visitors, but not nearly as many as you could be. By doing keyword research before you write an article, you can get a better sense of what type of content is most likely to bring higher volumes of traffic to your site. The Venngage team recently put together a Game of Thrones Infographic because of the increase in excitement for the new season premiere. We knew that we wanted to create an infographic about all the betrayals that occurred throughout the previous five seasons, but we didn’t know which keyword would be best to target. As you can see here, the term “Game of Thrones” receives nearly 7.5 million average monthly searches, and has low competition. What this means, is that a lot of people are Googling “Game of Thrones.” Naturally, with that many people looking for information on the series, there is an abundance of content on the subject. Although the term is low competition, the first thing that appears on Google is HBO. For those of you who are not familiar with Game of Thrones, HBO is the official network broadcasting the series. Guess how many inbound links that page has? It’s 4066…so far. The second site is IMDB and the third is Wikipedia. Yeah, we’re dealing with the big guys here. So we opted not to target that keyword. We decided instead to settle on either the term Game of Thrones Betrayals with 50 average monthly searches, or Game of Thrones Infographic with 880 average monthly searches and therefore more potential for increased blog traffic. Although the content was relevant to the betrayals which took place in the series, the term infographic is far more relevant to our site and has a much higher volume of traffic. 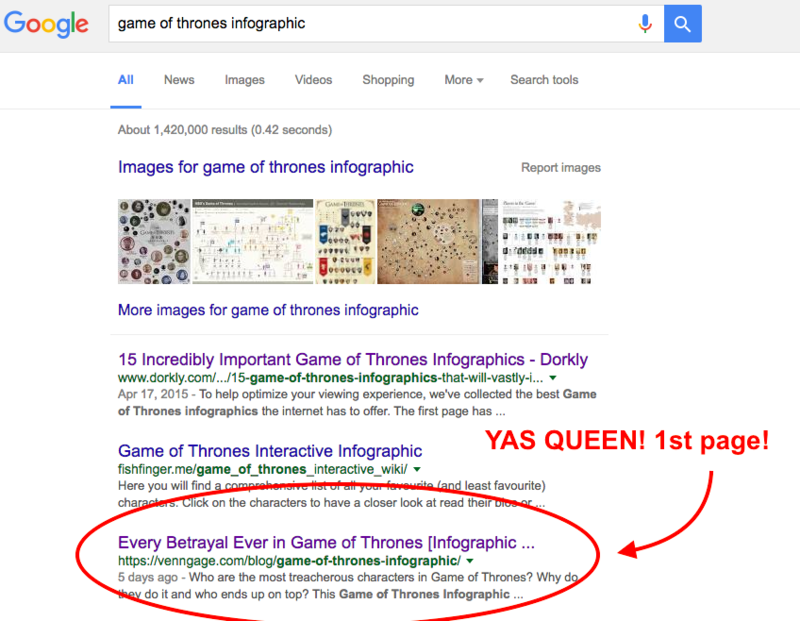 Now whenever someone searches for “Game of Thrones Infographic”, there is a good chance they will find our source naturally. 1. Create a list of keywords. Now I use Google Keywords Planner to build my keyword lists, but I’ve heard some great things about Long Tail Pro as well. Sticking with the example of Game of Thrones, let’s assume you run a GoT fan site. Naturally, the majority of the content you create would be relevant to the series. Type the term “Game of Thrones” into the keyword tool and then export the list of suggested words. If you are an infographic maker like Venngage, then you would type the term “infographic” and find similar terms. Makes sense? Most of the content you create on your blog is going to bring in long tail traffic, so aim to target a keyword that gets more than 400 monthly searches, but less that 10,000. Why? It’s just going to take a lot longer to rank on some of those higher volume keywords right away. That being said, it all comes down to preference, so if you rather target really high volume words, go for it, but you will need patience and hard work. We’re going to aim to target keywords that are between 400 to 1,300 average monthly searches. Start by filtering out everything that doesn’t fall into that category. We’re also going to focus on optimizing for words that have a low competition. Lucky for me, due to copyright laws, many terms related to Game of Thrones are not super competitive keywords! Some people will tell you to target high competition keywords. If they are high competition and you can somehow outrank them, then it’s a win, right? But why would you waste your time and money working towards ranking for just ONE term, when you can rank for 20 different terms that are low competition and still bring in the same, or even more traffic, right? Just my opinion. I did not intentionally mean to use so many Lord of The Rings memes and gifs. It just happened…in case you were wondering. 3. Select the top 10 relevant terms. Nice work! Now you have some inspiration for new content as well. The next thing to keep in mind when optimizing your content for SEO is the keyword density percentage and meta descriptions. This is probably the most exciting part about SEO! I’m totally joking. I can’t believe you fell for that again. All this means is that throughout your article or blog post, you need to be using your chosen keyword frequently enough that Google considers it to be relevant content, but not so frequently that it seems like you’re keyword stuffing. There is no exact percentage that is considered perfect, but typically anything higher than 10% is a bit much. I like to aim for 2% to 6%. All this means is that in a 100 word article, if you use your keyword 10 times, your keyword density would be 10%. So in a 1000 word article, using the word 10 times is a keyword density of 1%. Get it? Pretty straightforward right? 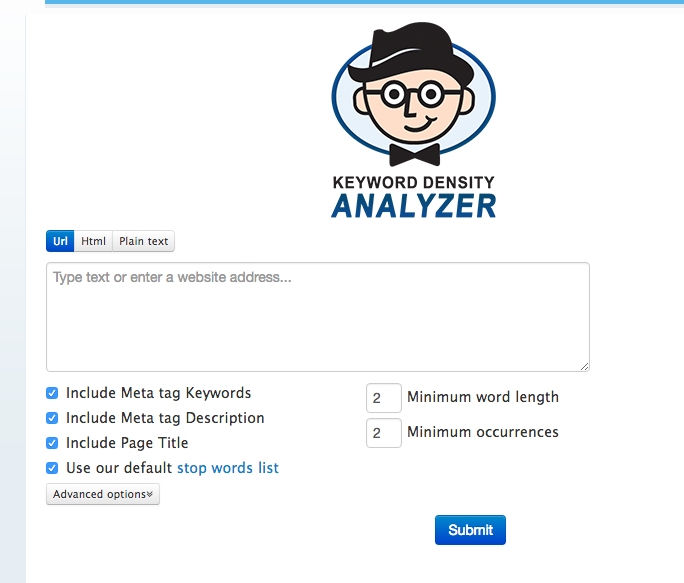 A good way to check your keyword density is with Seobook’s Keyword Analyzer. You can just copy and paste your entire article as plain text and you will end up with something looking like this. 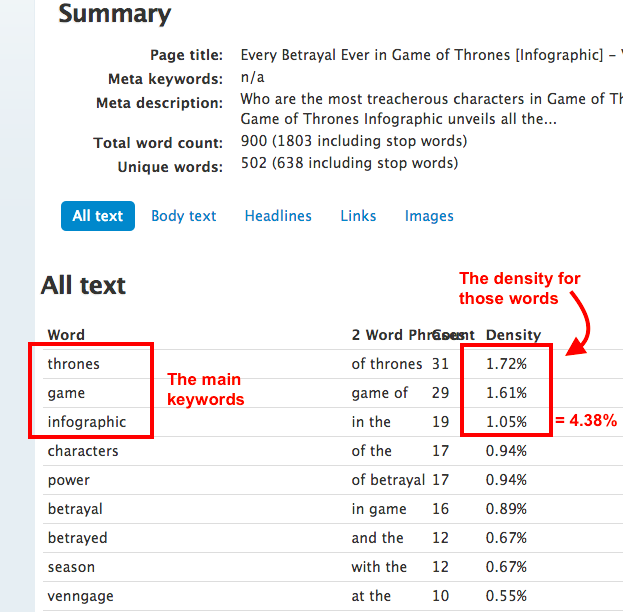 Notice that the words with the highest density percentage all make up our targeted keyword, “Game of Thrones Infographic”. Add up the percentage of each of those words and that’s the keyword density! As you can see, we hit a 4.38% keyword density which falls within the range we wanted. I’m telling you, SEO doesn’t need to be that complicated! Your meta description is a short sentence describing what your article or page is about. The keyword you are targeting should be present in the meta description, in the title and in the URL. It’s a great idea to plug your keywords into your H1, H2 and H3 tags when it makes sense. Your H1 tag is the the title tag. In the case of this article you are currently reading, the H1 is 37 Proven Methods To Increase Blog Traffic and Boost Engagement. The H2 tag is the sub-header of your article, in our case that would be, “Step 1: Increase Blog Traffic by Understanding Your Audience Personas”. Your H3 is the heading within your H2 section, “How To Figure Out Who Your Optimal Audience Is”. These tags basically function as bullet points for Google’s all-seeing eye to track down your content with more ease. It alerts Google that the content you are writing is in fact what you claim it is. 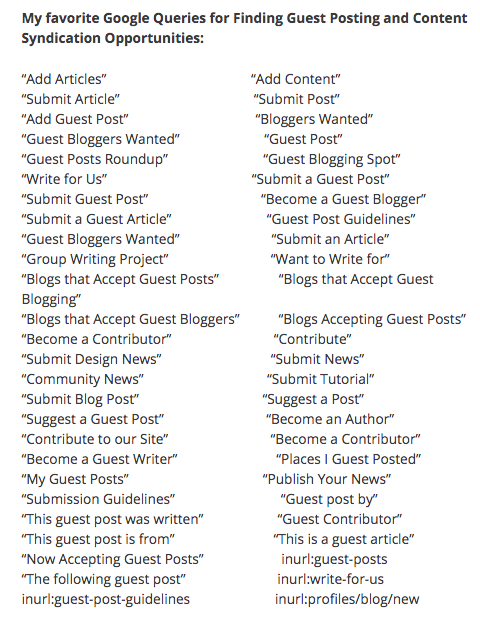 Based on all of this information can you tell what keyword I am optimizing this blog post for? The most important part about optimizing your content for SEO is actually producing very high quality content. Remember how we talked about Black Hat SEO before? Well, one of the techniques from the olden days that falls into the Black Hat/Grey Hat SEO category was to produce mediocre content very frequently at about 500 words per article. Ahrefs talks about this in more detail in their seo strategy. Basically, they go on to explain that they deleted almost 180,000 words from their blog, because producing excessive low-quality posts was actually harming their overall traffic. Instead of creating tons of meh articles, it better suits your time to focus on writing high-quality and informative blog posts. In other words, write P.E.A.C. content. What is P.E.A.C. you ask? P.E.A.C. stands for Practical value, Entertaining, Awe-Inspiring, and Credible. As a writer, marketer, businessperson, elf or wizard, your goal should be to provide value for your readers and users. Content that answers the questions your readers are asking and that is actually helpful is far more likely to result in natural inbound links. Also, people tend to shy away from overly promotional content and hate you more for publishing it. I mean if your content isn’t remotely entertaining and you don’t even bother injecting your personality or tone into the article, it’s boring. People don’t like boring. It puts you to sleep. And let’s face it, the core of a lot of marketing-related subjects are naturally boring, so it’s your job to make them interesting. Don’t be afraid to write with a conversational tone and add some humor to your posts. Does your content make people go Woooooah? If you ever watched Oprah, you might remember that she often talked about reaching that “Aha!” moment. If your goal is to teach your readers something, chances are there will be at least one person who reaches that “Aha!” moment. Even one little success is worthwhile. Use links. Lots of outbound links to relevant sources is a good thing. So many bloggers forget to include outbound links in their content. Not only does it tell Google that you’ve done your research and that your content is on point, but it tells your readers that the information you are sharing is credible and has been put to action by other people as well. Use lots of links, heck link to this article too! Some of the most successful bloggers, like Neil Patel know that in order to get more traffic, you need tons of outbound links. Creating high-quality and high-value content is not just important for SEO, but it’s important if you want to make an impression on your readers. If you produce lot’s of blah or meh content, no one is going to trust your word, and no one is going to link back to you because your writing won’t be in depth enough. Don’t just address a subject lightly, delve deep and get to the root of the topic. Show your readers that you know what you’re talking about. If you do a good enough job, they will reach out to you and thank you and ask for your opinion on their own content! And that’s a nice feeling. If you got too lazy or you’re just too busy to read the whole article, that’s totally fine. I’ve put together a quick breakdown of everything you need to remember. Google is like Sauron. They see everything you do, especially when you use Black Hat SEO tactics, so stick with using White Hat SEO instead. Do keyword research before writing your content so you know which terms will increase traffic and which have the least competition. 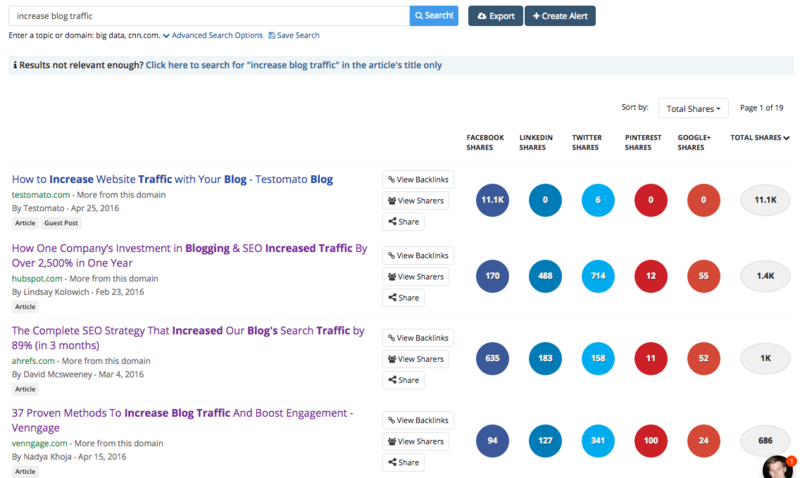 Use a tool like SEO Toolbook to figure out what the keyword density is in your blog post. Aim for less than a 10% keyword density, and at least a 2% keyword density. My recommendation is to hit between 4% and 6%. Include your keywords in the title, H2 and H3 tags when possible. Also include your keywords in the URL and the meta description of your blog post. Make sure your content is high-value by sticking to the rules of P.E.A.C. P.E.A.C. stands for Practical value, Entertaining, Awe-Inspiring and Credible. Don’t create mediocre or meh content. Offer your readers something that will help them and don’t be afraid to inject your own personality and tone when writing. Use lots of outbound links to relevant sources to reinforce the credibility of your content. For instance, if you write an article about SEO, you can link to this blog post because it will be relevant. What might have taken you 7 minutes to read the full article, only took 30 seconds to read the key takeaways. I sincerely hope this is useful to you, it certainly has been to us at Venngage when it comes to increasing our blog traffic. Your comments below are always very appreciated, and so are your tweets, Facebook and LinkedIn shares. Stay tuned for Part 3 where I will cover White Hat SEO outreach and link building tools and tactics. So now that you know how to conduct user persona research, and you know how to optimize your content for search, the next step is conducting outreach and building high level inbound links to your site. So that you can get your content to the top of Google and get people to help you promote it. Derrr. Here’s the thing, even after optimizing your content for search, there are so many blog posts published in a given day that it’s tough to break through the noise. To put it into perspective, it is currently 12:13 PM, Eastern Time and according to Worldometers there have already been 2,213,204 blog posts written today. I’ll update you again towards the end of the article with the new number. That being said, your one little article needs to somehow stand out from those two to three million articles that are written daily. Take a moment to scream or cry as you realize the gravity of the situation. But before you go into full panic attack-mode, rest assured that once again, I am going to tell you my deepest secrets and best strategies for breaking through the clutter of content that plagues the online world. By the end of this part, you should no longer be sending out terrible cold email pitches, and you will be better at establishing real relationships with influencers. So you’ve learned all there is to know about your users. 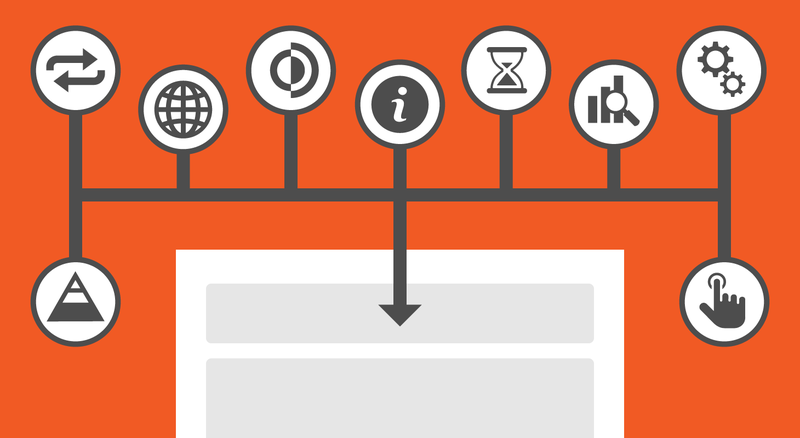 You’ve optimized your content for search and now you’re ready to tell the world about it. But how do you decide exactly who to tell about your content. When you finally email someone asking them to help you spread the word, will they care? The truth is, probably not. But we’ll get to dealing with rejection later. Unfortunately, most people you email asking to read or share your content for you, won’t actually do it. People are busy, so don’t take it personally. What you need to focus on instead is finding people who are most likely to engage with your content and, furthermore, who will be happy to share it for you. Do these people really exist, you ask? My dear child…yes. Yes they do. Now, remember all that keyword research you did up in Part 2? You’re going to do something similar to find potential contacts. I’m going to break down the process I use, but please note there are so many ways to build up a list of contacts, so I recommend you keep experimenting with different methods until you find what works best for you. They are both highly effective and I recommend both. All I have to do is type in a relevant keyword. In this case, let’s say that I am working on writing an article about increasing blog traffic, which I am (making this example super meta). Upon typing the words, “increase blog traffic” into the keyword section, I am presented with a beautiful list of anyone on Twitter who has shared content in the past year pertaining to “increasing blog traffic”. BOOM! This is me, creeping from behind the Twitter bushes, looking for people who’ve shared relevant content. Based off of this simple search, you now know that there are 5955 results of individuals on Twitter who have shared some type of content pertaining to the subject of increasing blog traffic. This gives you 5955 people who you can eventually ask to share your content. After all, why wouldn’t they? They’ve shared something like it before, right? We’ll get to that in more detail later. This tool is another awesome one. It’s even easier to use because it only has one box that you can type things into. Amazing. A list of everyone associated with Venngage is listed by importance (notice I’m the first one after @venngage) so that you can reach out to them easily. But let’s say you want to pitch your content to someone who writes at Mashable! You can follow the exact same method. Just type in “@mashable” and you will get a long list of writers and editors who work for Mashable. Breathe deeply as you take in all of this valuable information. Last but not least is the “Most Shared Content” tool. It functions in a similar way to both the tools above, but this one searches the web for content that matches your keywords, and which has had the most interactions on social media in a given period of time. 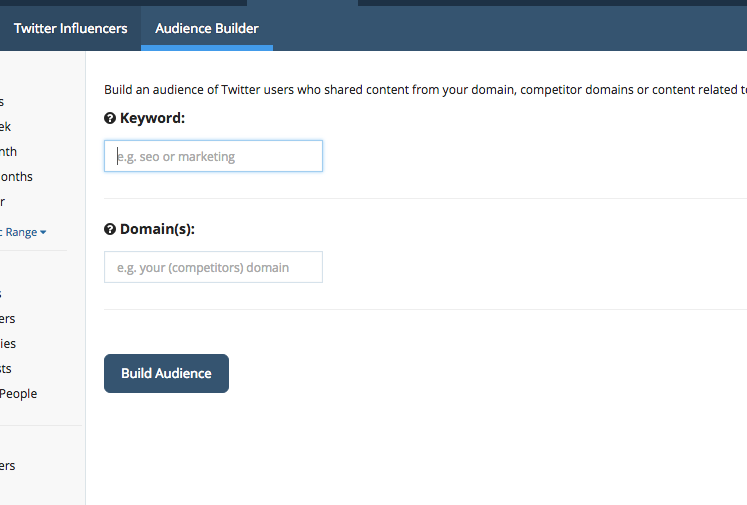 If the content you are trying to promote mentions a number of different keywords, you can search them all using this tool and find thousands of articles that are relevant. All you need to do is export the list of Most Share Content and reach out to the authors asking them to include a link to your blog post in their blog post on a similar topic. 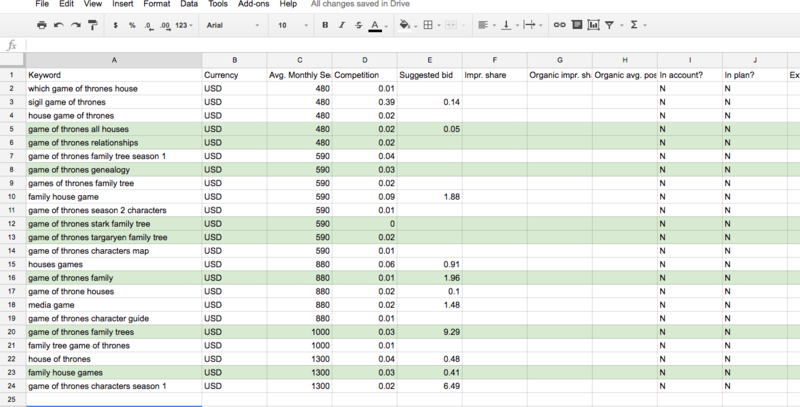 Once you’ve exported all your lists, import them into a Google Spreadsheet. Filter through the data to eliminate anything that received fewer than 30-50 social shares. Go big or go home! On the other hand, if some of the results you get are from sites like Buzzfeed, The Verge, Vox, or any of those big media publications, it might not be worth your time trying to reach out to them for your marketing related content. Chances are you will get a big old “NO!”, or simply be ignored altogether. I tell you this from experience but by all means, if you are determined to try, go for it. A VA is a virtual assistant you can hire on a site like Upwork. They basically test out different emails using something like Rapportive until they find the right one, and then plug it into your spreadsheet for you. You can totally do this on your own, but it will take forever. It’s much easier to hire a VA to do the menial work for you while you focus on producing awesome content. Another option is using a tool that can find some or most of the emails for you. It probably won’t get them all but it’s a great way to get started on your outreach. I recommend Connector by Contentmarketer.io. Once you’ve filtered out your list of contacts, as long as you have the first and last name of the authors who wrote each blog post, Contentmarketer.io makes finding their emails easy. Like…REALLY easy. All you need to do is upload the document and it will automatically fill in the blanks for you. I said it was easy. I don’t always recommend manual outreach, but it is definitely worthwhile if there’s a very specific link you are after. It consists of manually researching each person, taking a few notes about their content, and finding their email. Let’s say you idolize one particular marketer, and love all of their content. You would do anything to get a link featured on their site, or have them recommend your business. It’s probably not the best idea to lump them together with everyone else you’re contacting, especially if they are a high level influencer like me. Just kidding, I’m a nobody. Manual outreach is a great idea if you are working on putting together something like an expert roundup, or you’re trying to get some content featured on a site with a high domain authority. It consists of contacting them personally- either through their website’s contact page, through Twitter, or with an extension like Rapportive. Here’s a brief guide I wrote in more detail about reaching out to influencers manually. Your list is finally ready for outreach. But before you start firing out those emails, you need to prepare the proper pitch. After all, what’s the point of doing all that preliminary work if no one even reads your email? An analysis conducted by MailChimp found that the trick to writing the perfect subject line is to simply describe the subject of your email. Try to avoid making it sound too sales-y. Your audience will likely get frustrated if the content of your email doesn’t actually meet their expectations. The actual content of your email is asking your reader to share a blog post on “Tips for house cleaning”. Is that the best thing your readers will have seen all day? Maybe for some who have a questionable social life but for the majority, the answer is probably not. Producing a clickbait headline is much different than writing a deceiving one. Rather, be straight forward and tell them what the email is about. Period. This part of the email is your opportunity to really make a first impression. Think of it as a first date with the individual you are outreaching to. If they don’t like you on the first date, they won’t even bother going on a second date with you. I hope you’re having a great week so far. [FRIENDLY FOLLOW-UP] My name is [Name] and I work for [Company]. I read your blog post: [TITLE/URL], and loved it! What this shows them is: 1) You know who they are, 2) You’ve actually read something they worked on. In other words, it’s an ego boost. In this portion of the email, you essentially pitch what you’re offering. It’s important to show your reader how the thing you are offering will benefit them. For instance, if you mentioned them in a blog post you are requesting they share, tell them that. Explain that you loved their content and linked to it in the post. The Ask is where you…surprise! Ask for something. This would usually be asking for a social mention or a backlink to your site in one of their articles. If possible, try to pin down an existing article the influencer wrote, and indicate an exact line in that post that you think the article would be relevant. Another alternative is to ask if they would be willing to include a mention to your content in a future article. The final part of your email is the sign-off. This is where you choose how to conclude your email. Try not to sound too demanding. Don’t say something like, “I expect to hear from you soon”. It’s rude and no one will answer you. 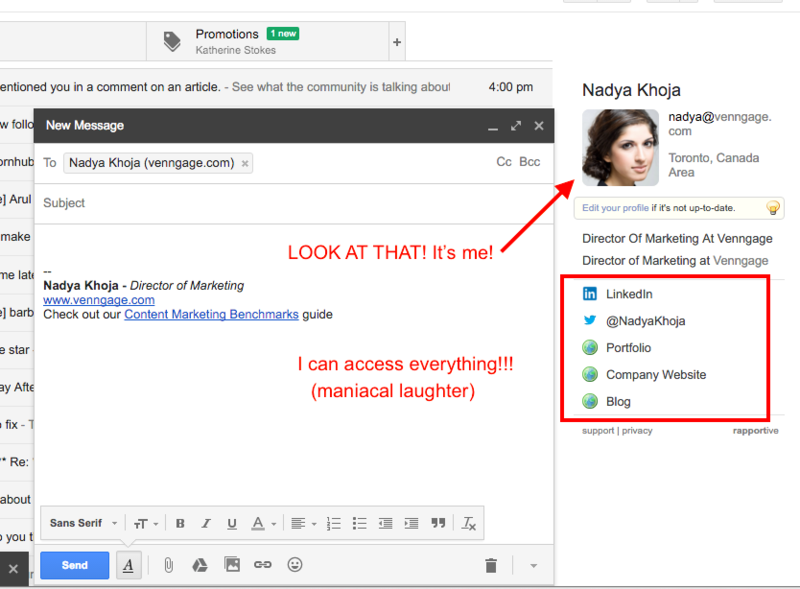 I’m not being a diva, I’m just trying to help you put together the most effective email pitch you can. Avoid coming off as obnoxious and pushy. People don’t like obnoxious. Just be courteous and show your appreciation towards the influencer for potentially helping you out. Raise your hand if you like asking for links? Probably not many of you because it’s not the most fulfilling task and it often results in rejection. I’ve never really understood why granting someone a link is such a big deal if the content is relevant and the outreach is done well. Unfortunately, I don’t have a method that will assure you a one hundred percent success rate when asking for links. Many people will say no to you. What I can tell you, though, is how to get used to rejection. This is probably you right now. Unimpressed and bitter, right? The kind who when told no, accept the answer and move on to the next opportunity. In a nutshell, avoid being the first kind of person altogether. The second kind of person is good to be sometimes, but not when you are asking other people for a favor like a backlink. The third kind is perfect when it comes to outreach. 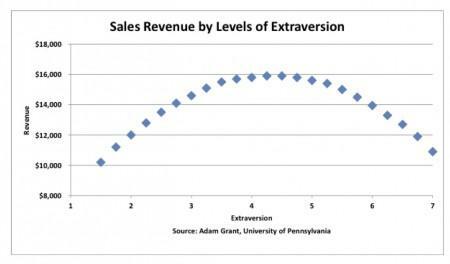 It essentially says people who are too introverted or too extroverted are not very effective when it comes to sales. Those who are both sometimes introverted and sometimes extroverted, however, are great salespeople. Unfortunately, not many marketers and PR people consider themselves salespeople. But you are. You are selling someone on an idea and in this case, you are selling someone on the idea of giving you a backlink. What are introverts really good at? Listening. What are extroverts really good at? Talking. You need to be able to do the right amount of both in order to build a relationship with the person you are outreaching to. That being said, when someone tells you, “No, I am not interested,” you need to listen to that and move on. Trust me, they will have better respect for you in the future. On the other hand, if someone tells you they will think about your offer and get back to you, it’s totally okay to follow-up with them a few times, just to nudge them more in the direction of a yes. Sent an email and didn’t hear back? It’s not the end of the world. 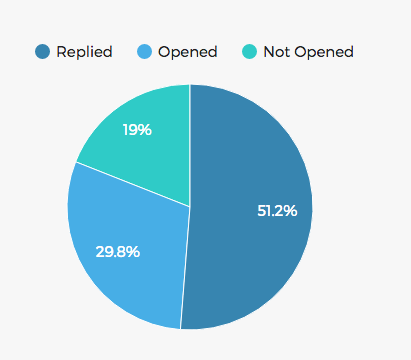 Here’s a chart which depicts my average email outreach open rates and reply rates. That’s right. An 81% open rate and a 51.2% reply rate. Not to brag, but that’s pretty damn good. I’ll be honest, most of those replies did not happen with my first email. My follow-up email drove a few more replies but it was my third follow-up which brought in the bulk of the responses. The lesson? Sending follow-up emails works. As I’ve mentioned before, I used Contentmarketer.io. You can easily upload a CSV file with all of your contacts into the tool and prepare up to three additional follow-up emails. 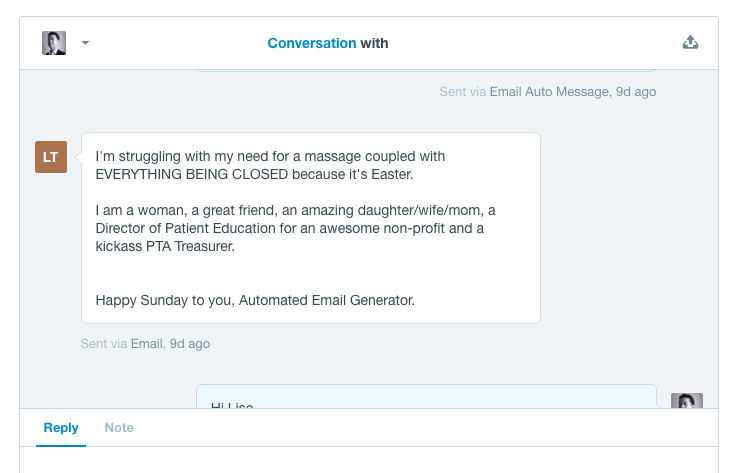 The great thing is that the tool automates everything for you and doesn’t send anymore follow-up emails once you get a reply. 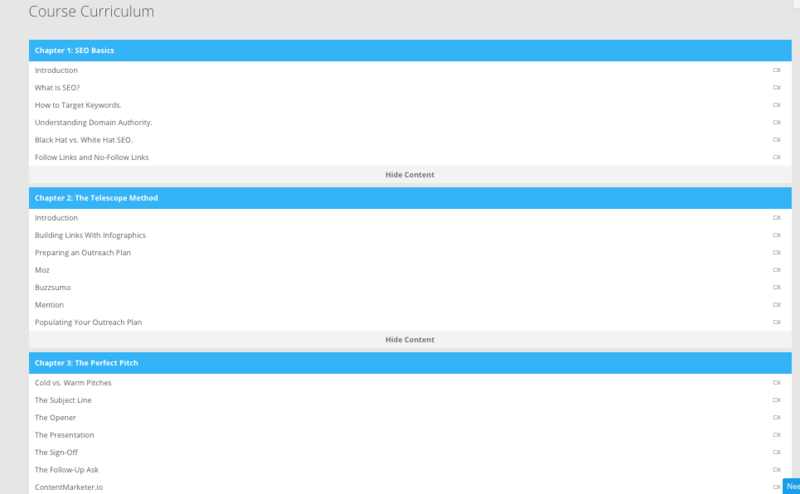 It also tracks all your opens, responses and clicks for you, making it easy to view your results. Wait two or three days to send the first follow-up email. You don’t want to come off as too pushy right off the bat. Wait five to seven days to send the second follow-up email. Don’t send a third follow-up email; it’s overkill. Every email after your initial email should be shorter than the previous one. Once someone replies and shows interest, move that email thread to a folder that you can come back to later. It’s important to nurture existing relationships as frequently as possible, and not necessarily only when you have something you want links to. Imagine you have been talking to someone on Tinder for a while and you have a huge crush on them (yes, I use a lot of Tinder and dating analogies because I spent too much time on it in university). The only problem is they live out of town. One day, you find out they will be in your city! Wouldn’t you ask them to meet up? I’ll give you an example. Last weekend I went on a trip to New York City. I remembered speaking to a writer at a web-based publication in New York (no, I did not have crush on him). In the past he had included a link to an article the Venngage team had worked on. We kept in contact and every time I had a new article that may have been of interest to him, I sent him a message. I emailed him before my trip to see if he would be interested in connecting in person and grabbing a coffee. He said yes and I was able to meet up with him and get to know him better. Outreach and marketing is all about relationships. Whenever an opportunity comes up that allows you to nurture an online business relationship, do it. It will only be more valuable in the long-run. After meeting up with that writer, we became friends and now he and his wife will be visiting us in Toronto. Notice that someone you did some co-marketing with will be attending a conference in your city? Reach out to them and schedule a meet-up. Chances are you won’t regret it. When it comes to getting actual links, who do you think will be more likely to do you a favor? A friend or a stranger? If you said “a stranger,” you really need to reconsider your friendships and find a new crew. You differentiate yourself from the hundreds of people who send annoying pitches daily. You have a go-to list of contacts you can reach out to frequently in the future. Sure, you can get a different list of contacts every time you write a new article, but wouldn’t it be so much better to hit up the same people every now and then? Chances are they will say yes and be happy to help you out. At 12:13PM EST there had been 2,213,204 blog posts written already. By 3:46PM on the same day, there were 2,852,001 blog posts written. It’s almost impossible to go viral and break through the noise. Without conducting solid outreach and nurturing your relationships with new contacts, no one will ever see the work you do. It doesn’t matter if you spent one hour on an article or one month (which I feel is how long I’ve been working on this one…) the fact is that there is just too much content. Rather, focus on making yourself stand out from the crowd. In case you didn’t read this whole article, you can download the cheat sheet right here, which summarizes all of the important points you need to know. What if I told you that you could get tons of traffic to your blog, without even having to write a single sentence? Well, that would be a lie, because you can’t do that. 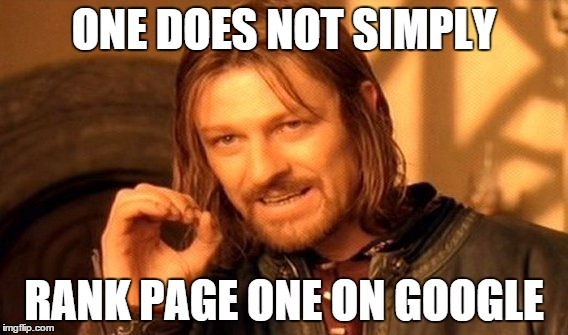 Like we’ve learned in the above three sections, you HAVE to create content and optimize it in order for Google (aka, the Eye of Sauron) to see that content and boost it up on the SERPs (search engine results pages). You also know that you need to conduct outreach and build links to that content in order to bring in organic traffic. But what else can you do to influence how much organic traffic your content is getting? Let’s assume I wanted to repurpose this very article into multiple other pieces of content. No content is truly original because every marketer on the web is pretty much regurgitating the same information. Done. Now that that’s covered, you might be asking yourself: what my options are for repurposing content? Well, why don’t you take a knee and I’ll tell you what I could do for this very post you’re reading. What can I do in order to spread the love? Well, this article is broken up into sections, right? So I can republish each section as an individual article elsewhere. And way too many others to name. What else can I do to repurpose this beast of a post? These are just a few possibilities that come to mind. Shall we take a deeper look? According to a recent survey Venngage conducted, 41.5% of marketers said that infographics resulted in the highest level of engagement. More so than any other type of visual content, including videos. But how do you even begin to turn 15,000+ words into an infographic? Infographics usually have less than 500 words, right? It’s actually a lot easier than you might think. You just need to trim the fat. As you’ve likely come to realize, for every 1,000 words I write, there’s probably only one or two sentences of actual gold hidden under the piles of text. The rest is just me blabbing about Sauron, or Frodo, or some other Lord of the Rings reference. I mean, if you take a look at this section so far, I’ve maybe said one or two useful things. And I even bolded it for you so it’s easy to find. Go ahead, see if you can find the core message. It was “republish each section as an individual article elsewhere”. The truth is, a lot of blog posts are like that. There is always a core message, or a couple of core points that you can pull. That’s what you want to include in an infographic. After all, infographics are a visual way of summarizing complex information and data. This is essentially the intro of the story, right? How do you condense this passage into just one sentence? Now, if we were to paraphrase all of this into one or two sentences, what would we get? Once you’ve gone through all your content, you should be left with a perfect outline for your infographic. All that’s left is to choose your favorite graphic design software and visualize your outline. Just a reminder, your favorite software is Venngage, OK? OK.
Another way you can repurpose your content is to publish it as an ebook. Ebooks are a great way to generate leads and emails (i.e. access to people’s souls…). Literally save the document as a PDF. It’s not necessary for you to design something spectacular, but if you do want your ebook to outshine all those other bland looking ebooks on the web, I recommend using a template like this one. You can also make a white paper, which is just a more “business-y” way of saying ebook. Here is a white paper template. Just be sure to add a table of contents, and page numbers for easy navigation. That’s really all I have to say about ebooks. The reason I’ve bundled podcasts and videos into one section is because if you create a video, the audio can easily be extracted and used as a podcast or audio recording. Remember those days in high school when your teacher would just play a video on the subject you were studying, rather than make you read a chapter from your textbook? Were you not relieved? A lot of people prefer watching a video to reading. It’s just the truth. Am I one of those people? No! I hate waiting for videos to buffer and I would rather scroll through a gnarly article. But using videos in your content can actually boost your rankings on Google because they can increase time on page when someone actually does watch the video (more on that later). Here’s the catch, though. Your video should–ideally–be good. As in, it should have a high-production quality. Not only is the content great, but the pace is fast and not drawn out due to good editing. Naturally, if you are on a budget and don’t know anything about editing videos, it’s not the end of the world. There are plenty of great instructional videos on YouTube that consist of a person talking into a camera. Usually, those people are really exceptional speakers and great storytellers, so the quality of the content makes up for the lack of fancy equipment and transitions. If you have none of those skills, then you’re screwed. But that’s ok! Because you can repurpose your content into other mediums instead. The benefit of republishing your content on SlideShare is that the reach of the site is incredible. Millions of people go to SlideShare organically, so the opportunities for referral traffic are really high. Of course, the catch is that the slide decks that get the most views are the ones that make the featured page. It really just seems like you’re being set up for disappointment, doesn’t it? 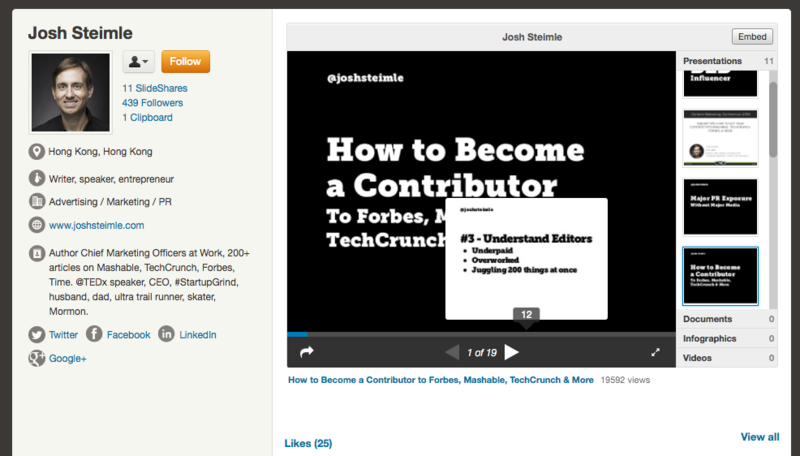 Learn how to get featured on SlideShare from the experts. So how do you go about putting together one of these slide decks when you have no design experience? You might be under the impression that your slide deck needs to be an illustrative masterpiece, or the Mona Lisa of all SlideShare presentations, but it doesn’t. In fact, some of the top performing slide decks are the simplest ones. Remember before when I talked about pulling the core message from your content to create an infographic? Well, creating a SlideShare presentation follows a similar pattern. You want to get to the point and simplify the message for your audience. Josh Steimle’s SlideShares are perfect examples of simple, yet effective designs. Josh is a MASTER at repurposing content. Every single one of his slide decks have a black or white background, and black or white text. It’s very simple, but very effective. Some of his decks have close to 100,000 views! Go check him out on SlideShare to see for yourself. Once you’ve done the work and trimmed the fat from your content in order to create an infographic, that same outline can be used for your slide deck. Another option is to turn your content into a course. You can then post the course onto a site like Udemy, or use a course builder like Thinkific and host it there! Making a GOOD course can be quite time consuming, but there is a lot of opportunity for lead generation, and even money generation! Since the main purpose of all blog content is to IDEALLY educate one’s readers, identifying the main subject of your course should be easy-peasy. Start by breaking up the content into sections, or chapters. Within each chapter, identify what the subcategories are going to be. Many courses are made up of short videos explaining simple concepts. By providing your audience with bite-sized nuggets of information, the process of learning what may seem to be a complicated subject becomes way more achievable. Aim to make each video or “lesson” between two minutes and 10 minutes long. Anything longer than that and you’ll start to lose your audience’s attention. Foundr Magazine’s Nathan Chan does an exceptional job of providing his audience with thorough, yet digestible lessons in his course on getting more Instagram followers. A while back I started working on a beginner’s SEO course. Did I ever complete this particular course? No. Am I still planning on completing it? That’s a great question. I did at least get most of the videos and audio recordings completed…it’s just a matter of adding all the elements. The first chapter covers “SEO Basics,” but that chapter is made up of more specific definitions that help the student gain a better understanding of the basics. I even have an entire chapter on writing good pitches. One section is dedicated entirely to writing a good subject line. See what I mean by bite-sized content? Really drill down to the finer details and your students will thank you (probably). If you are really interested in creating a course, I highly recommend checking out Thinkific’s blog.There are lots of useful lessons to help make you a better course creator! OK, so I’ve touched on how to repurpose your blog content into multiple formats. Doing so will not only save your brain from having to constantly think up new content, but it will also help drive more traffic back to your site. The more channels and publications you dip your toes into, the better yours chances are of building a name for yourself. So if your eventual goal is to become an influencer within your niche or industry, start by spreading your knowledge to as many different platforms as possible. You’ll reach new audiences that way. I know this section was initially supposed to be about repurposing content but since we’re having so much fun already, I thought I’d also tell you a bit about click-through-rate, also known as CTR. It’s called CTR because it’s just an abbreviation of click-through-rate. Now why is CTR important for improving your traffic? Well, it’s actually two-fold. A high click-through-rate has a huge impact on your search rankings. If more people are clicking on YOUR link over other people’s links, you will climb the SEO ladder of success. 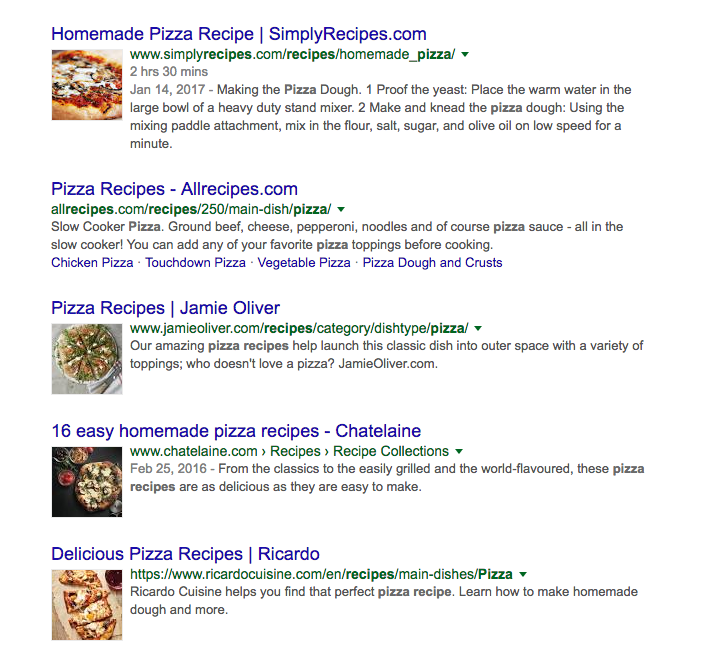 Let’s assume that you are ranking on the bottom of the first page of Google for the term “pizza recipe”. 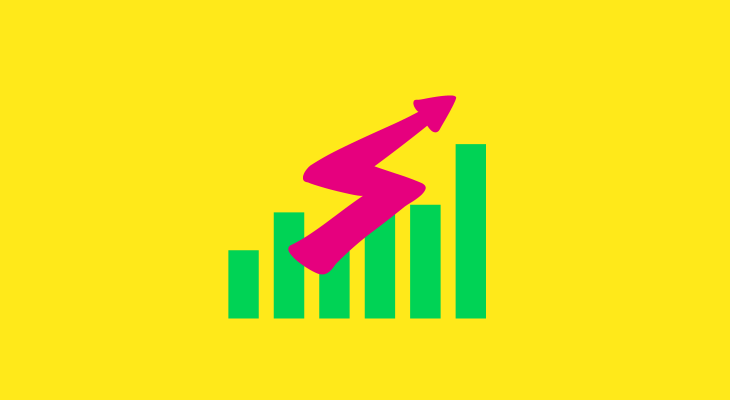 You want to appear higher in the rankings and you’ve created some great content and built some links but you’re noticing that your climb to the top is slow. First, start by search for the term “pizza recipe”. What do you notice about the recipes that are already ranking? The first result, unlike the second and third, says “Homemade Pizza Recipe”. Chances are that if you are looking for a pizza recipe, your plan is to make it at home. Which link are you most likely to click? But now look at the fourth result. The title of the page is “16 easy homemade pizza recipes”. That looks appealing, too, since you have the option of choosing between multiple recipes. The bonus is that those recipes are easy and homemade! My guess is that the ranking position of that fourth result is due to a better CTR than to a stronger backlink profile. Let’s take a look at the link profiles for both of those results. This page has incredible reach. It also has over 900 sources linking back to it directly. Based on that, what number of backlinks do you think the Chatelaine article is getting? Half? A third? A quarter of the links? How is that possible? Even with only four links, the page still appears on the first page, and unlike the first result, the traffic keeps going up. My guess is that the Chatelaine article ranks where it does due to its high click-through-rate. Google takes CTR very seriously. If a lot of people are clicking on a particular link, it sends Google a message that the page in question is the one people want to see! As a result, that page climbs higher up the ladder. What are some things you can do to improve your CTR? Learn what other people are buying ads for. If you’re trying to rank for a high competition keyword, identify what your competitors are spending their money on. 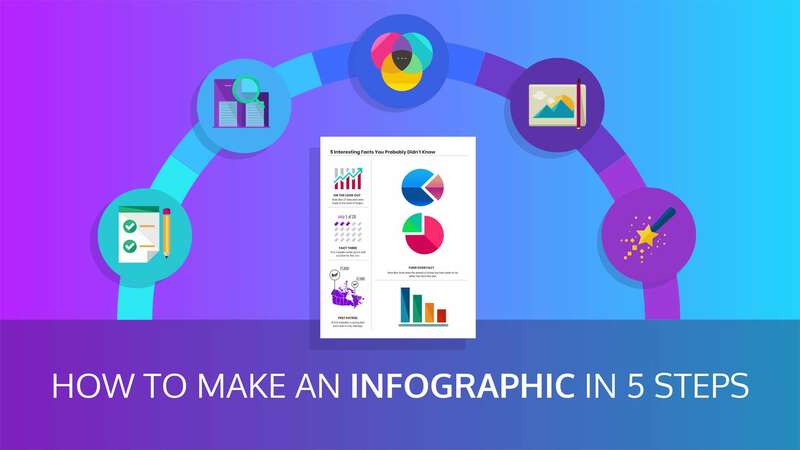 For instance, if I Google the term “infographic design”, I can see that more than one company is spending money on the term “Expert Infographic Design”. The reason being that the keyword in question probably results in a CTR. Use the power of numbers. Including a number in your page title can have an overwhelming impact on your CTR. Brian Dean uses the example of Pinterest to portray this. 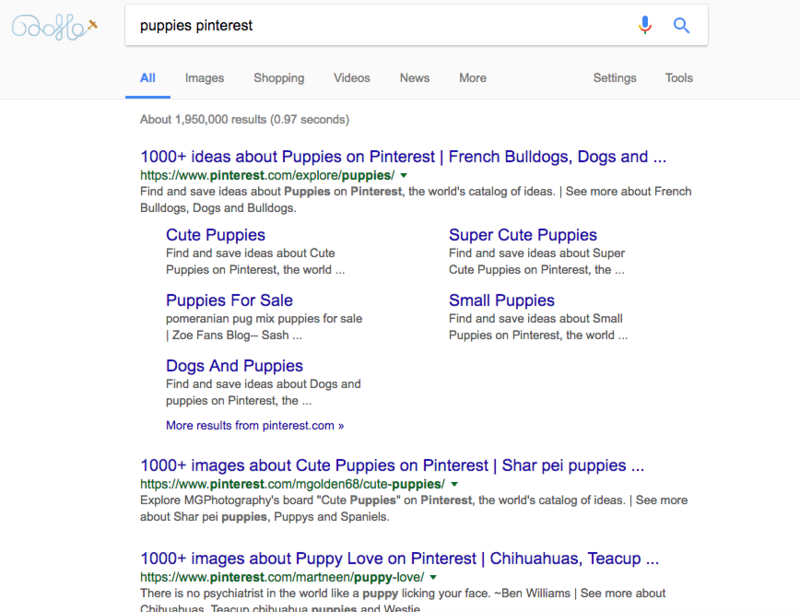 For instance, if I search for “puppies pinterest”, I’m not just given one result with a picture of a puppy. Instead, I’m brought to an entire category on Pinterest which showcases “1000+ Ideas about Puppies”. A number, especially a BIG number, gives your audience something tangible to grasp onto. Organic click-through-rate is not your only option for boosting blog traffic. Investing in Google Adwords can also lead to some huge benefits. Recently, I spoke with Kuba Koziej, the co-founder of Zety, a professional resume builder site. He was telling me about a “secret technique” he used to double site traffic overnight by focusing specifically on improving CTR for Adwords. Increasing click-through-rate can be a powerful strategy for getting more site traffic overall. There is, however, one thing you can do to boost your traffic by 100% overnight. Best of all, it doesn’t require writing new content or building new links. How is this possible? Well, we used one particular technique and almost doubled our traffic overnight for a single career guide on Zety. What is the secret trick, you ask? The difference between ranking first and fifth could mean a 500% surge in traffic. But how do you get all of these visitors? Improving CTA can give you a massive number of extra visitors almost instantaneously. The best way to improve your CTR is to A/B test your titles. You can do this with expanded text ads in Adwords. In layman’s terms, it basically means the you don’t need to enter a display URL that matches your final URL destination. Instead, AdWords will take the domain from your final URL and show it as your ad’s display URL. Come up with a few title options and start testing your ad campaign. You can also test your meta descriptions, but try to keep it a bit shorter as you won’t be able to include all the characters. Make sure you include only head terms. These are just search terms that are short, popular and straightforward, like “helicopter skiing” or “hobbies and resume”, or “Hogwarts and reality”. These terms are based on a bell-curve distribution of keyword usage that displays the high numbers of most-used terms at the “head” end of the bell curve graph. Using head terms will show your ads to all of the people who Googled these two keywords in a phrase. For example, “hobbies and interests to put on a resume”, or “will attending hogwarts ever become a reality”. Here was our original title. With an existing CTR of around 6%, naturally we were far from perfection. Once you get enough “click data”, you can come back to your Adwords panel and see which titles are performing best. But don’t stop there yet. Take a look at your “search terms” report to see what your users are actually Googling to find you. Our report showed that people were mostly looking for “examples”. We focused on this word, and we created an ad that included the term “Examples”. The result? We beat the original CTR by over 400%! 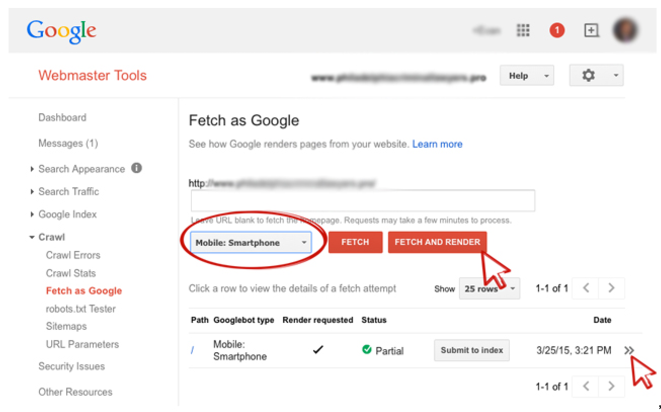 To speed up the process of indexing your changes use the Fetch as Google option in your Google Search Console. This lets you test how Google renders a URL on your site. You can use Fetch as Google to see whether the Googlebot will be able to access a page on your site, to see how it renders the page, and whether any page resources (such as images or scripts) are blocked to the Googlebot. Didn’t I tell you we would have more fun? There you were, thinking you’d just be learning about repurposing content, but you actually got an additional lesson on CTR. If there is anything you’re still confused about, or would like to learn more about, please let me know in the comments! I read every single one. Next time, we will cover some super hacks on how social media and email marketing can help increase your traffic EVEN MORE.